True CBD Hemp Oil was created with purity and potency in mind. In a 1oz bottle, it provides 250mg of Cannabidiol, as well as a full spectrum of other cannabinoids including CBC, CBD, CBG, and THC. True CBD Hemp Oil is analyzed through a High Pressure Liquid Chromatography (HPLC) test for aerobic organisms, yeast, fungus, E. coli, and heavy toxic metals. When you're considering using Cannabidiol oil as a dietary supplement the potency and purity is critical to the impact that it will have. That is why all True CBD Hemp Oil is triple lab tested to ensure potency and purity every time. Due to FDA regulations, we cannot make claims about the benefits of CBDs in general or with specific ailments. We do, however, suggest that you conduct your own research from the abundant reputable sources available online. A search of any specific ailment with CBD will provide one with many resources to investigate. YouTube is an incredible source in this respect as well. INGREDIENTS: Cold Pressed Virgin Hemp Seed Oil, Infused With CO2 Extracted CBD Concentrate (250mg Cannabidiol). 100% Hemp, Sourced from Family Farms in the UK and Israel. The CBD oil concentrate in True CBD Hemp Oil is a full spectrum CO2 extraction of the whole plant from a Hemp strain of Cannabis Sativa grown in the U.K., legally imported through FDA tariff codes. The hemp grown on these farms (as opposed to marijuana), is usually ideal for cannabidiol (CBD oil) extractions, as it is naturally high in CBD and low in THC. The CBD oil concentrate in True CBD Hemp Oil is from hemp grown legally on family farms in the U.K. It is done under the regulations of the governing bodies in those countries. Hemp never needs pesticides, fertilizers, or herbicides in it’s cultivation, and requires much less water than standard commercial farming. The hemp we derive our CBD oil concentrate from is NON-GMO and is grown under the same methods and standards of organic farming, but at this time there is no legal procedure for the organic certification of hemp cultivation in the countries we import our CBD oil concentrate from. We’re expecting the process for organic certification of hemp to be available soon, and we will certify ours as soon as it is possible. The CBD oil concentrate in True CBD Hemp Oil goes through a complex set of refinements and lab tests to ensure for all levels of potency and purity. First, it is extracted through a high pressured, super critical CO2 extraction, and the raw CBD oil is then imported legally into the U.S. following FDA regulations, where it is further refined at a certified GMP (Good Manufacturing Practice) facility. To determine the purity and potency of every batch of CBD oil each extraction is analyzed through a High Pressure Liquid Chromatography (HPLC) test for aerobic organisms, yeast, fungus, E. coli, and heavy toxic metals, and is also analyzed for the cannabidiol (+ other cannabinoid) potency. Once the final True CBD Hemp Oil product is prepared, we have it once more, further analyzed for potency and purity. With such attention to detail and redundant testing, we are also able to identify many other trace cannabinoids. Our lab results consistently show naturally occurring trace amounts of CBC, CBD, CBG, THC, and many other cannabinoids, making True CBD Hemp Oil a Full Spectrum Cannabinoid Extract. There is a lot of evidence and common-sense wisdom to suggest that the different cannabinoids work synergistically to support the whole human endocannabinoid system. The Cold Pressed Virgin Hemp Seed Oil we use as a base carrier for the CBD oil concentrate is from hemp seeds grown in Israel. The hemp seed is from a hemp variety of Cannabis sativa. It is grown without the use of any pesticides, herbicides, fertilizers, and is totally GMO free. True CBD Hemp Oil is truly 100% HEMP and this increases the overall spectrum and diversity of cannabinoids present in the final product. True CBD Hemp Oil does not need to be refrigerated, although it will extend shelf life. Keep out of direct sunlight and heat. Store in a cool, dry place. Shake well before using. Most people start with 5 -15 drops and increase as desired. The amount of CBD oil that people take on a daily basis can vary greatly. We recommend doing a search with CBD and the symptoms that you wish to learn about. You will find testimonials giving specific doses and durations reflecting personal experiences. The only side-effect of taking True CBD Hemp Oil that has been reported to us is sleepiness.This can usually be alleviated by cutting back on the dosage. *This product does contain a naturally occurring trace amount of THC from legally imported Hemp CBD Oil. If you search online, and it is not hard to do so, you will find patent number 6,630,507 states unequivocally that cannabinoids are useful in the prevention and treatment of a wide variety of diseases including auto-immune disorders, stroke, trauma, Parkinson’s, Alzeheimer’s and HIV dementia. The patent, awarded in 2003, is based on research done by the National Institute of Health, and is assigned to the US Dept. of Health and Human Services. That’s right, the US Government has had the patent on CBD’s for over ten years! 2) How does CBD interact with our body and is it safe? Humans all have what’s called an Endocannabinoid system. We naturally produce different cannabinoids in our bodies. We have two major cannabinoid receptors, the CB1 and the CB2 receptors, and these receptors are found in the brain, the nervous system, the immune system, and in all major organs, as well as scattered throughout our bodies. The effect of CBD on these receptors has been well researched and shows that CBD’s are stimulating the production of our own internal cannabinoids, and strengthening our whole Endocannabinoid system. Each one of these receptors responds to cannabinoids, whether it be from human breast milk in babies, or from True CBD Hemp Oil drops. This essentially means that the human body was built for cannabinoids, and we manufacture, in our bodies, endocannibinoids. It is well established in the medical community that these nutritive substances play a critical role in protecting cells against disease, boosting immune function, protecting the brain and nervous system, and relieving pain and disease-causing inflammation, among other things. Cell membranes in the body are naturally equipped with cannabinoid receptors which, when activated by our endocannabinoids, and various other nutritive substances, protect cells against viruses, harmful bacteria, etc… It has been well documented that human breast milk is an abundant source of endocannabinoids, (cannabinoids made by our bodies). Hemp is the ONLY known abundant source of cannabinoids, outside of our own bodies. Our cannabinoid receptors are also activated when these cannabinoids are introduced. The Endocannabinoid system is intricately linked to our nervous system and immune system, as well as our brain and digestion. Therefore by stimulating and strengthening the Endocannibinoid system through the introduction of CBD into the body, there may potentially be a wide range of effects. As stated previously, Cannabidiol (CBD) is naturally occurring in our bodies and is naturally present in healthy mothers breast milk. To the best of our knowledge, there have been no reports of serious side effects from CBD, or Cannabis at all for that matter. CBD is widely considered one of the safest dietary supplements available, with no known allergies or ill effects. Upon taking extremely high doses one may experience a great desire to rest or sleep. 3) What are the legalities around CBD? Our Hemp CBD oil products are legal to consume, sell, and possess both here in all fifty states and in many other countries. Hemp oil is a dietary supplement that is permitted for use in or as a dietary supplement, and it is imported as raw hemp oil under approved tariff codes to its FDAregistered and GMP certified facility in the U.S.
procedures required to schedule a substance. The DEA’s definition of “THC” contravenes the unambiguously expressed intent of Congress in the CSA and cannot be upheld.” So, because the CBD we are using comes from Imported Hemp, True CBD Hemp Oil is legal, and exempt from marijuana and THC laws. When the laws change, and hemp production is legal in the United States, we will be the first to offer locally produced True CBD Hemp Oil -Guaranteed!! 4) Why does True CBD Hemp Oil get CBD from Hemp and not Marijuana? CBD is CBD, no matter if it is from Hemp or Marijuana. True CBD Hemp Oil is from 100% Hemp for many reasons. Hemp has been bred to have low levels of THC, and some naturally has high levels of CBD. Marijuana has been bred to be high in THC and low in CBD, with a few exceptions; namely Charlottes’ web. The strains of marijuana that are being grown with a very high CBD content, are presently very rare. The growers that do have high CBD marijuana strains are struggling to provide for everyone who wants and is sometimes desperately seeking CBD. Our CBD percentage from hemp is still comparable to these high CBD marijuana strains. It does not have high levels of THC. This of course would not be legal in all fifty states, nor would it be preferred by many who do not want its effects. Speaking genetically, Hemp and Marijuana can be the same plant. trace amount of THC. Fortunately, the cannabinoid profile of hemp is ideal for people looking for benefits of CBD without the psychoactive effects of THC. 5) How does True CBD Hemp Oil compare to Rick Simpson Oil? Rick Simpson Oil actually refers to a method of extraction, NOT a specific product. The Rick Simpson method can be used with any number of different strains of marijuana, so the THC and CBD content is always varying greatly, depending on the marijuana being used. Usually Rick Simpson oil is a variety of marijuana with a very low CBD content (and high THC), because that’s what most of the marijuana is. In states where growing marijuana is legal, many people are making there own marijuana oil blends using this Rick Simpson method; typically produced by filling a cylindrical glass or stainless steel canister and flooding the canister with a solvent — usually butane — that strips the plant matter of its cannabinoid-containing oils. The resulting mixture of psychotropic plant oil and chemicals is then purified to remove traces of the solvent. One common method of butane removal includes boiling it off in a hot water bath, while another involves the use of a vacuum pump and vacuum chamber to lower butane’s boiling point, pulling butane from the oil. This unregulated and sometimes very dangerous practice has created enormous amounts of awareness regarding the benefits of cannabinoids. Countless testimonials show that when done correctly, and in a controlled environment, this method can produce a safe and effective oil. Unfortunately it has also created lots of confusion and misunderstanding due to its lack of standardization. EVERYONE IS USING DIFFERENT STRAINS OF MARIJUANA. The amounts of cannabinoids differ from plant to plant and the ratios of THC/CBD are totally inconsistent. This results in a lack of potency and consistency. Trace amounts of pesticides, herbicides, fertilizers, as well as butane and or other solvents not completely cooked off can reside. There is NO oversight or testing being done, creating a large potential for contamination. The levels of THC are 99% of the time to high to be legal on a Federal level, or in states where marijuana is still illegal. Needless to say, for most people this is not a very good option. The CBD in True CBD Hemp Oil is a full spectrum CO2 oil extraction of stalks and stems from a Hemp strain of Cannabis sativa grown in the U.K. True CBD Hemp Oil comes from hemp that is naturally high in cannabidiol (CBD), so the CO2 oil extract consistently has a high amount of CBD and only trace amounts of THC. True CBD Hemp Oil is highly standardized and lab tested THREE TIMES, to verify for purity, and to insure that the CBD content is consistent and true! The two oils and the benefits that they can provide are similar. But our True CBD Hemp Oil is standardized and will always have a high content of CBD cannabidiol (250mg per 1oz). The THC content is always below legal levels so no matter who you are or where you are, True CBD Hemp Oil is legal and available for you. unequivocally that cannabinoids are useful in the prevention and treatment of a wide variety of diseases including auto-immune disorders, stroke, trauma, Parkinson’s, Alzeheimer’s and HIV dementia. The patent, awarded in 2003, is based on research done by the National Institute of Health, and is assigned to the US Dept. of Health and Human Services. That’s right, the US Government has had the patent on CBD’s for over ten years! As stated previously, Cannabidiol (CBD) is naturally occurring in our bodies and is naturally present in healthy mothers breast milk. To the best of our knowledge, there have been no reports of serious side effects from CBD, or Cannabis at all for that matter. CBD is widely considered one of the safest dietary supplements available, with no known allergies or ill effects. procedures required to schedule a substance. The DEA’s definition of “THC” contravenes the unambiguously expressed intent of Congress in the CSA and cannot be upheld.” So, because the CBD we are using comes from Imported Hemp, True CBD Hemp Oil is legal, and exempt from marijuana and THC laws. When the laws change, and hemp production is legal in the United States, we will be the first to offer locally produced True CBD Hemp Oil -Guaranteed!! CBD is CBD, no matter if it is from Hemp or Marijuana. True CBD Hemp Oil is from 100% Hemp for many reasons. Hemp has been bred to have low levels of THC, and some naturally has high levels of CBD. Marijuana has been bred to be high in THC and low in CBD, with a few exceptions; namely Charlottes’ web. The strains of marijuana that are being grown with a very high CBD content, are presently very rare. The growers that do have high CBD marijuana strains are struggling to provide for everyone who wants and is sometimes desperately seeking CBD. Our CBD percentage from hemp is still comparable to these high CBD marijuana strains. Hemp strain of Cannabis sativa grown in the U.K. 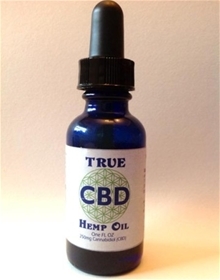 True CBD Hemp Oil comes from hemp that is naturally high in cannabidiol (CBD), so the CO2 oil extract consistently has a high amount of CBD and only trace amounts of THC. True CBD Hemp Oil is highly standardized and lab tested THREE TIMES, to verify for purity, and to insure that the CBD content is consistent and true! 6) How do I learn more about CBD’s? There is a tremendous amount of information available online. We highly encourage you to do your own research and remember that this is more than anything a grassroots movement that has grown its wings and is now taking flight. Ask your friends and neighbors about CBD. You just might be very surprised at the level of awareness that is already all around you. Of course we are always available to answer your questions as best as we can. NOW Pure Frankincense Oil, 1 oz.